It seems safe to assume that anyone who’s reading this site has purchased a chocolate bar before. But have any of you purchased one that’s gone to a good cause? If not, here’s your opportunity to do so. 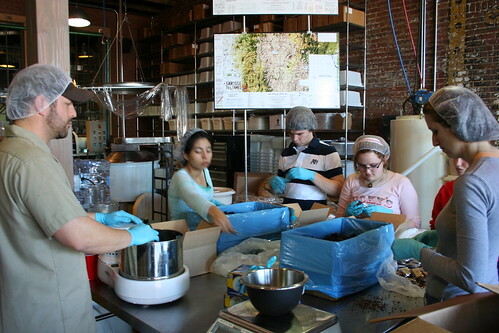 Askinosie loves making chocolate, but they also love to give back to their community. One of their projects, Chocolate University (a partnership with Drury University) aims to give high school students business knowledge by using their very own chocolate company as a model. Chocolate University’s founder, Shawn Askinosie wants to take the program a step further by inviting the 13 students of his Cocoa Honors program to travel with him to Africa in search of the cocoa beans that will become the next line of Askinosie Chocolate bars. While on their trip, the students will learn about the cocoa industry, “within the context of the history, culture, and economy of Africa”. They will also meet with farmers and help out in the community. Askinosie is one of very few small batch “bean to bar” chocolatiers in the U.S. and as such it’s awesome that they are up for sharing this unique experience with others. This sounds like something that anyone would want to be a part of, whether you are a fan of business, education, travel – or simply – really good chocolate. If you want to help the group experience this incredible hands-on journey, participate in the Ebay auction for five first-batch single origin dark chocolate bars from Liberia, Africa. The auction started yesterday and ends on April 11th. Read more about Chocolate University.